On July 19, 2018, a concert devoted to the opening of the 11th Conference “Concord of Orthodox Youth” was held at the Religious Education Center of the Ekaterinburg Diocese in Russia. The event united young people from the Russian Orthodox Church Outside of Russia and the Ekaterinburg Metropoliate. I would like to wish you all that you be frank, real and proper. We hope that very many things change in the future and that life becomes kinder, better and closer to our hearts. That is what is necessary, so that there be no borders between our peoples, so that everyone has an open heart, reflecting the call of Christianity that you preach by your very lives, that it continues forever. Ivan Yurievich Paderin, Head of International Relations of the Department of Internal Policy of the Sverdlov oblast Sergei Pavlovich Loktionov, President of the Organizing Committee of the International “Concord of Orthodox Youth” also spoke. A group of young people then performed Russian songs and dances in traditional costumes. Since this year’s event coincided with the Royal Days, the podvigi of the last Russian Tsar, Emperor Nicholas II and his family were a focal point. Letters of correspondence between Tsar Nicholas and Tsarina Alexandra were read to the audience. The organizers were happy to see young people from Australia, who spoke fluent Russian, make their first visit to Russia, and sang Russian folk songs. The anthem of the “Concord of Orthodox Youth” was sung. The youth came to Ekaterinburg to prayerfully commemorate the Holy Royal Passion-bearers on the 100th anniversary of their martyrdom, participating in Divine Liturgy at the Church-on-the-Blood and the Royal procession of the cross on the night of July 16-17, 2018. 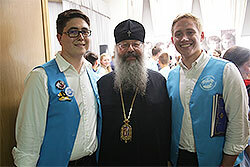 A total of 91 persons from various dioceses of the Russian Orthodox Church, including parishioners of the Russian Orthodox Church Outside of Russia from Australia, Germany, Belarus, Canada, USA, Georgia, Israel and Ukraine attended.